This event is hosted by Review Wire Media and is dedicated to all coffee lovers! All participating blogs are offering a 40 count box of Java Factory k-cups, each blog a different flavor! Grab your favorite cup of joe, sit back and stop by all the blogs where you can read up on all the different Java Factory coffee flavors…you may discover something new. Tales From a Southern Mom recently had the opportunity to sample some coffee for a special “Coffee Hop” from Java Factory. Coffee, you know, one of my very most favorite things on earth. Naturally I jumped at the opportunity! When my box of coffee arrived, I was a bit surprised. I was expecting a sampler pack of a few cups of different flavored coffee. The first thing that surprised me was the fact that they sent me 40 K cups of coffee. That’s a heck of a sample!! The next thing that surprised me was that all 40 cups were the same flavor. You see, each blogger participating in the Coffee Hop is getting a different flavor. I admit, i was really puzzled at that part. How was I supposed to do a thorough review of only 1 item in their product line? What if i didn’t like the flavor? Well, there was really no need to worry about that. The flavor I received was “Vanilla Dream”, which is a vanilla and toffee flavored coffee. I happen to LOVE vanilla coffee, and I love toffee flavor even more! This is flavored coffee, no milk or sweeteners are added. I see this as a bonus, as it means that the person drinking the coffee can dress it up or down any way they wish. So, I opened up the box. The box is actually quite handy…You can open the top like any other box and put your cups in a carousel or drawers if that’s how you usually store your coffee cups. Or you can just open the handy little opening on the side which allows you to put the box on the shelf and pull out one cup at a time. And I brewed a cup. Boy, does this coffee smell heavenly!! Rich, mellow, and complex. There is nothing wimpy, weak or bitter about this coffee at all. It’s a medium bodied roast and is as smooth as can be. The aroma of vanilla and toffee was apparent but not overpowering, and more to the point it didn’t smell “fake”….it smelled like vanilla toffee is supposed to- natural. Like someone had been making some candy in the kitchen. I take milk in my coffee so I added some milk, and it was lovely just like that. That’s how I will likely drink most of this coffee. But, I will admit, it got me thinking. As I don’t live close to a specialty coffee shop, I usually make my own “fancy” coffee at home. What all did I have in my coffee arsenal that could really take this over the top? I added a spoonful of caramel. WOWEE was that ever good!!! Maybe THAT is how I’ll drink this coffee….coffee + milk + caramel. But another of my favorite coffee additives is Nutella. That’s bound to be good in this too. I could go on, but there are hundreds of ways to dress up a cup of coffee, and really, this coffee is good enough it doesn’t NEED to be dressed up. Its really excellent. Java Factory coffees come in the following flavors: “Da Bomb”, “Dark and Handsome”, “Smooth Caffeinator”, “Choconut”, “Vanilla Dream”, and “Wakey Wakey”. All of them sound good. I am still sorry I didn’t get to try the other flavors. I’m going to have to find them and give them all a try. Now, what is a “Coffee Hop” you ask? 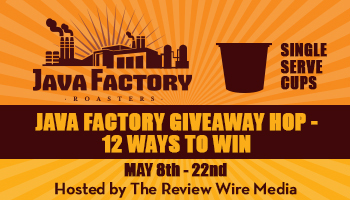 Well, not only is Java Factory generously giving away one box of 40 k cups in Vanilla Dream flavor to one lucky Tales From a Southern Mom winner, but you can visit the other participating blogs and enter for a chance to win a box of the flavor that they reviewed too! The Java Factory Event Bloggers are not responsible for shipment of the prizes. I was provided with product for this review. All views and opinions with regard to Java Factory or the company are my own and were not influenced by the company. All entries will be verified. Only one entrant per mailing address per giveaway. If you have won the same prize on another blog, you will not be eligible to win it again. The winner will be chosen randomly and contacted via email. A reply to the winning email is required within 48 hours before a new winner is chosen. One person entering per household please. I put nothing in it! I prefer it black. I use an artificial sweetener and occasionally some vanilla flavor. My husband just got me a K-cup machine for Mother’s Day. I LOVE it! I can make a fresh cup of coffee anytime I want. Now I need to stock up on cups for it. I like cream, sugar, ad a shot of vanilla or hazelnut flavor in my coffee. Nothing! Just plain old, delicious coffee! I use real half and half. No sweeteners. I put milk and a TON of sugar in my coffee. I like it super sweet! I like to add sweetener to my coffee. I guess it’s hard to say what is healthier, depends on medical findings of the year but I usually use the pink stuff. I actually drink my coffee black. I don’t add anything to my coffee. I like it strong and black. I put sugar and cream, and whatever flavoring I have on hand! I add cool whip & flavored creamer. I take coffee mate, sugar and milk. I put two teaspoons of sugar and lots of cream! It’s the way I start every day! If I’m at a restaurant, cream and sweetener. If I’m at home or work, 2% milk and sweetener. I always use creamer (Vanilla most often) and a sweetener. I recently started using Sweet Drops instead of sugar, but will continue to go back and forth between the two. I put Spenda and a flavored creamer in my coffee. I put cream and sugar most of the time but sometimes I put Carmel flavored cream. I like putting Almond Joy creamer in my coffee. I put sugar and powered creamer or real cream in my coffee. If it’s good coffee — just half and half. but some days I go for the Creme Brulee flavored creamer….. I put skim milk and sugar in my coffee. I add a pinch of sugar. I put Italian Sweet Creme creamer in my coffee. I don’t put anything in my coffee. I mix cocoa into my coffee! I use lots of sugar and lots of Creamer. I put sugar and either cream or sugar in my coffee! I like my coffee with cream and sweetener. I am fairly simple. I just put a little milk and sugar in my coffee and I am good. I don’t usually add anything to my coffee, I like to drink it black. I put lots of cream and sugar.